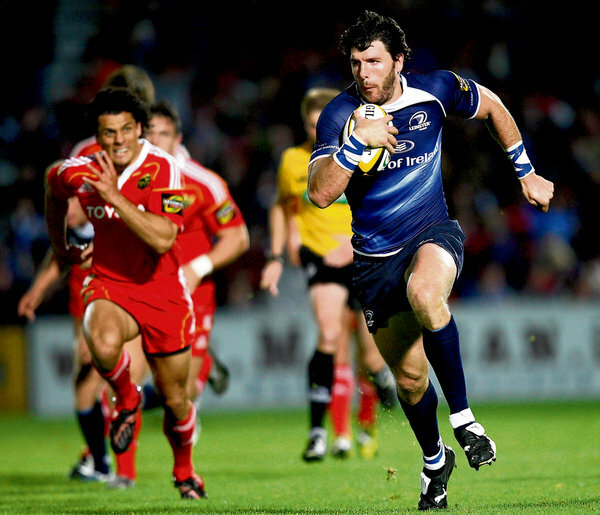 Shane Horgan couldn't have chosen a better game in which to make his 200th appearance for Leinster. The versatile back sits on 199 matches played ahead of Leinster's clash with rivals Munster this weekend and is scheduled to wear the number 14 jersey in Thomond Park on Saturday night. That milestone will probably be the furthest thing from the 32 year old's mind as this is a must win game for Leinster. It may be a top of the table clash but Munster lead Leinster by 12 points atop the Magners League. Leinster are holding onto second place but barely as they aren't the only team sitting on 55 points ahead of this weekends fixtures. Should Leinster lose in Limerick, both the Ospreys and Ulster would have a chance to overtake them in the table. No matter the outcome for Munster, they are guaranteed to still be clear in first place come Monday morning. Leinster are bringing a strong side to Thomond however with their first choice backline, minus Rob Kearney, all in tact. Isaac Boss has held onto the number 9 jersey to continue his partnership with Jonathan Sexton while Gordon D'Arcy and Brian O'Driscoll remain the ever presents in the center. Munster are also featuring their regular stars as Donnacha O'Callaghan returns to partner Paul O'Connell in the pack while the backline remains unchanged from last week's clash in Cardiff. In all Munster have made three changes to the side but Connor Murray is not one of them. The scrum half, who has impressed in recent times, has staved off the return of Peter Stringer to the squad once again to start alongside Ronan O'Gara. The selection of Felix Jones and Johne Murphy ahead of Paul Warwick indicates Munster's hopes of having more speed to defend the Leinster stars, while also creating a more dynamic attack. Munster have a heavyweight bench full of Internationals so expect them to try to use that in their favor on Saturday night. Had this been any other game for Leinster, the focus would surely have all been on Shane Horgan, who is the first player ever to reach the 200 match milestone, but everything takes a backseat when Munster and Leinster clash. Munster v Leinster kicks off at 19:30 GMT on Saturday. Tickets are completely sold out but the game is being broadcast on RTE television. F Jones; D Howlett, J Murphy, L Mafi, K Earls; R O'Gara, C Murray; W du Preez, D Varley, T Buckley; D O'Callaghan, P O'Connell capt; D Ryan, D Wallace, J Coughlan. Replacements: M Sherry, M Horan, J Hayes, M O'Driscoll, D Leamy, P Stringer, P Warwick, S Tuitupou. 15: Isa Nacewa, Shane Horgan, Brian O'Driscoll, Gordon D'Arcy, Luke Fitzgerald, Jonathan Sexton, Isaac Boss, Cian Healy, Richardt Strauss, Mike Ross, Leo Cullen capt, Nathan Hines, Kevin McLaughlin, Sean O'Brien, Jamie Heaslip. Replacements: Aaron Dundon, Heinke van der Merwe, Stan Wright, Devin Toner, Rhys Ruddock, Eoin Reddan, Ian Madigan, Fergus McFadden.